SDR inclusion will have minimal material impact on RMB today. RMB volatility will increase when capital controls are relaxed, but this will take years. SDR inclusion will have minimal material impact on RMB today. RMB volatility will increase when capital controls are relaxed, but this will take years. On November 30, 2015, the IMF announced that the Chinese Yuan/Renminbi (RMB) would become a component of the Special Drawing Rights (SDR) basket. This event was heralded as recognition that the RMB is a “reserve currency” and China has become a “financial super power.” People have compared the RMB’s inclusion in the SDR to the historical events in which the US dollar supplanted the British pound sterling as the most important currency in the world. Knee-jerk reactions by many market commentators have been that the yuan should appreciate because “trillions of dollars” will flow into RMB-denominated assets in the coming years. However, there is a caveat to those headlines—those predictions rely on China liberalizing the currency, specifically the capital account. Inclusion in the SDR itself is not very impactful, it is the deregulation of the RMB that people believe will come with inclusion in the SDR that would be impactful. SDR is an instrument created by the IMF in 1969 for a problem that existed with the Bretton Woods fixed exchange system. At the time, central banks of each country had to hold reserves in US dollar or gold to maintain their fixed exchange rates, but there was not enough US dollars and gold to serve this purpose. SDR would serve as an international reserve asset (worth 1 US dollar or 0.888671 grams of gold) to supplement foreign reserves, but the Bretton Woods system collapsed in 1973. In the modern era, SDR serve primarily as a unit of account for the IMF. SDR served as a liquidity instrument during the 2008 Global Financial Crisis. Only SDR 21.4 billion existed until the financial crisis and then the IMF created SDR 161.2 billion in August 2009 so that countries could supplement their foreign reserves by borrowing SDR from other IMF members. SDR 204.1 billion exist today. The SDR has symbolic significance for the RMB because it contains the world’s “main” currencies. Additional fanfare comes from the RMB’s heavier weighting than the Japanese Yen and Pound Sterling. It is not true that central banks must replicate the composition of their foreign reserves based on the composition of the SDR basket. 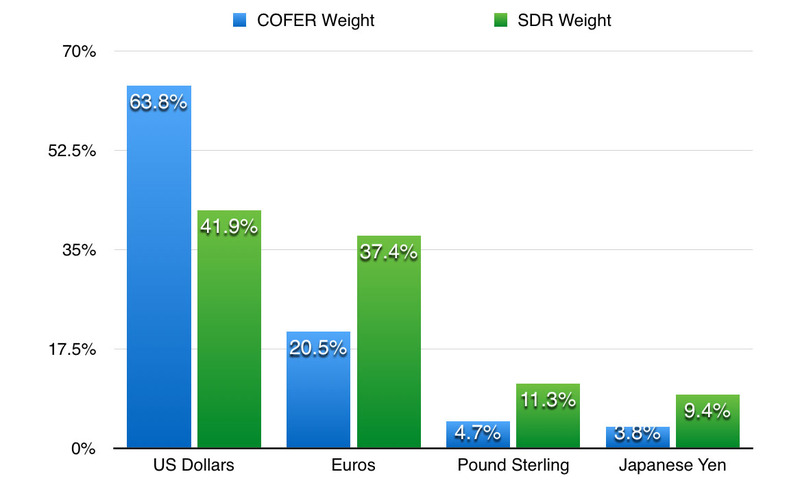 The below chart depicts the Composition of Official Foreign Exchange Reserves (COFER) to the composition of SDR based on data provided by the IMF in Q2 2015. Countries hold more assets in US dollar and less in other currencies than the SDR basket holds. The IMF states that countries are under no obligation to mirror their foreign reserves to the SDR basket. BAML estimates that IMF members may acquire up to US$35 billion of RMB to rebalance their SDRs, which is a negligible amount to affect yuan trading. Andrew Colquhoun, head of Asia-Pacific sovereigns at Fitch: “What really matters is whether central banks and sovereign wealth funds start to see the renminbi as a viable store of liquidity and of value to rival the U.S. dollar. Such a shift seems unlikely while doubts persist over China's prospects for a smooth and orderly rebalancing, and while China retains widespread capital controls." Inclusion in the SDR basket alone is not a reason for Chinese RMB demand to increase. Many analyst predictions about capital flows into China mention that the inclusion of Chinese financial assets into global benchmarks will be the driver. MSCI has already stated that SDR inclusion does not affect its decision on including Chinese A-shares in its global indices. MSCI points to China’s capital controls as the main reason Chinese assets are excluded. China’s capital controls originate from the nation’s command economy roots. The RMB currency was created when the Communist Party of China (CPC) founded the People’s Republic of China, which was a closed economy until 1978. Once China opened to trade, RMB could only be used domestically and was the only currency allowed domestically. The People’s Bank of China (PBOC) stood between every transaction. The foreign party buying Chinese exports would transfer US dollars to PBOC, which would in turn transfer RMB to the Chinese company, which could not hold foreign currency. The PBOC set the exchange rate for these transactions, which weakened gradually from 1.50 RMB per USD in 1980 to 8.62 in 1994. RMB was strictly pegged at 8.27 from 1997 to 2005. The exchange rate was set at an unrealistic level in 1980, and typical for China’s liberalization programs, its adjustment came gradually. In 2005, China dropped the USD peg and switched to a system of fixing the RMB exchange rate to a currency basket and allowing RMB to trade in a band around this fixing. The trading band of the exchange rate has gradually increased from 0.3% in July 2005, to 0.5% in May 2007, to 1.0% in April 2012, to 2% in March 2014. Starting in 2010, RMB began trading offshore against the ruble in Moscow and later expanded to trading against the yen in Tokyo, pound in London, and Australian dollar in Australia. 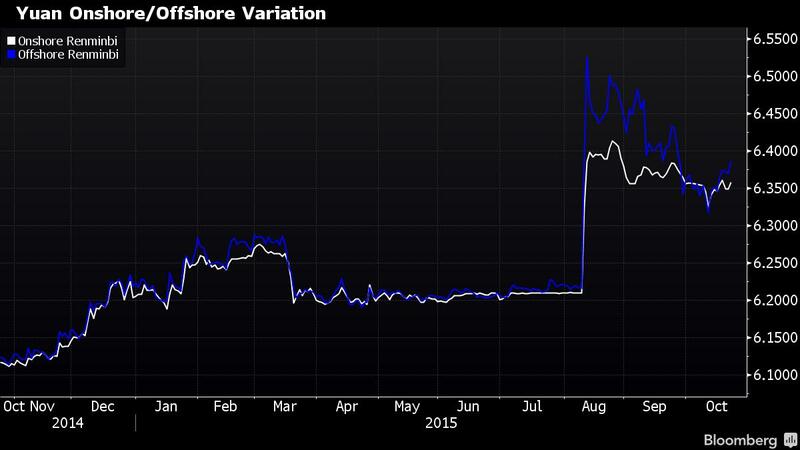 Again, China embraced offshore trading gradually. This also created a two-track currency in which the onshore exchange rate for RMB is set each morning by the PBOC while offshore exchanges have more freedom to roam. In 2009, China began to liberalize capital controls on the current account with a pilot program that allowed businesses in certain provinces to directly exchange currency in import and export with counterparties in Hong Kong, Macao, and certain ASEAN countries. Gradually over the years, China expanded the program to include all provinces in China and expanded the list of eligible countries. Any liberalization policy of the Chinese economy occurs gradually over many years. In November 2014, the Shanghai-Hong Kong connect began allowing foreign investors to purchase Shanghai-listed shares without prior approval. Plans are in the works for a similar system with Shenzhen-listed shares. In the IMF’s 2014 report, it notes the PBOC has amended regulations to enable RMB convertibility in 35 of the 40 capital account transactions that the IMF tracks for convertibility. The IMF has now stamped the RMB as “freely usable,” one of the conditions for inclusion in the SDR. The IMF’s perception may be that it is granting Beijing some leeway now with the expectation that China makes the RMB truly “freely usable” in the future. Many believe that the actions China has taken to win over the IMF for SDR inclusion is evidence that the momentum is there to gradually open the capital account to the extent Western investors expect. Many Westerners expect China to enable full yuan convertibility under the capital account as part of the nation’s 13th Five Year Plan. Speculation puts a 2020 deadline for further liberalization of capital controls, but China analysts have had no shortage of predictions about the next Five Year Plan: prognostications for grand plans that range from nuclear power to robots. The actual Five Year Plan will be released in March 2016. China maintains that capital controls are necessary to protect itself from the hot money investors that devastated ASEAN nations when they pulled their capital out during the Asian Financial Crisis. However, this isn’t the whole story. The CPC is aware that many of its own citizens try to move their assets offshore due to fears of confiscation and economic/political uncertainty. Capital controls have resulted in otherwise law-abiding citizens attempting to launder their savings out of the country through Macao casinos. The CPC understands that a true liberalization of RMB could result in a collapse in the exchange rate as Chinese citizens flood through the gates to convert their RMB to foreign assets the moment the gates open. Even with tight capital controls, China’s foreign reserves have already fallen from $4 trillion to $3.5 trillion as China tried to slow down the decline in the exchange rate during the capital flight this year. China’s perception of an end-state for capital account liberalization may not meet Western standards of free markets. An age-old adage, “actions speak louder than words,” is quite applicable here. Hours before the IMF announcement to include the RMB in the SDR, activity in the yuan exchange rate led many to believe the PBOC had ordered state-owned banks to buy yuan to prop up the offshore exchange rate (6.4515) that traded at a deep discount to the onshore rate (6.3962) set by PBOC that morning. The offshore rate quickly recovered to 6.42. It is common knowledge the Chinese government actively intervened in propping up the country’s equity markets this past summer amidst a broad sell-off. Actions included requiring the largest Chinese brokerages to buy stocks and refrain from selling, jailing short sellers and even those who spoke ill of the equities market, and state-owned investment funds buying equities—Goldman Sachs estimates that the Chinese government spent RMB1.5 trillion (US$236 billion) to support equity prices. Often, this form of market manipulation intensifies around political events in China. Officials reported that the equities market rose almost 5% on August 28 because the government wanted to create a “positive market environment” ahead of the military parade to celebrate the 70th anniversary of “the Chinese people’s victory against Japanese aggression.” It is no surprise that China intervened on yuan weakness right before the historic IMF announcement. Chinese A-share equities fell 4.5% on Friday (11/27) and coincidentally fully recovered those losses following the IMF announcement. China’s use of market intervention goes beyond economic protectionism—it is a political tool to shape the image of the country. China may not easily give this up. Examining the chart below that compares the onshore and offshore RMB exchange rates, it is clear that the offshore exchange rate fell much more in the August panic, but also volatility is regularly higher for the offshore rate. The offshore rate consistently tracks the onshore rate over time, so China has had success nudging the offshore rate to converge with its onshore rate setting. Understanding this leads to a thesis that contradicts the knee-jerk reaction: if the SDR inclusion is a sign that China will relinquish capital controls and market intervention, then Chinese assets ranging from RMB currency to A-share equities will move to their “true” values—and since this intervention has largely been an upward pressure for asset values, one can expect a downward move for Chinese assets if China were to fully liberalize its financial markets right now. This result is precisely why China will put off liberalization as long as it can—ideally until after a recovery from its current economic malaise. Despite its market intervention, China prefers the RMB to decline, but at a gradual controlled rate. Through its de facto peg to the US dollar, RMB has appreciated on a trade-weighted basis, making Chinese exporters less competitive versus producers in countries whose currencies have fallen significantly against the US dollar. RMB should fall against the US dollar as the Federal Reserve is set to reverse its loose monetary policy by raising interest rates while PBOC is still expected to cut interest rates and reserve ratio requirements. The 12-month forward is priced at a weaker exchange rate of 6.62. Some believe that PBOC will move to a hands-off regime with SDR inclusion and initiate a one-time significant devaluation in preparation. The concern for China is that a falling exchange rate creates a self-reinforcing cycle in which a depreciating exchange rate causes people to move assets out of the country, which in turn, depreciates the exchange rate further. PBOC believes it can manage the situation by obstructing capital from moving across borders and minimizing volatility in the exchange rate. Many prophesy that China is in for a hard landing. The country is overwhelmed by debt, already maximized its economic stimulus tools through infrastructure investment, and destined for hard times for a myriad of reasons. In this scenario, the RMB will fall. Others predict China will avoid the apocalypse. In the event of capital account liberalization, the RMB will rise as Chinese financial assets become part of global portfolios and RMB becomes a trusted storage of value for currency users around the globe. This is the “trillions of dollars of capital inflow” scenario that many connect with SDR inclusion. The future of China is a topic beyond the scope of this analysis and the below trade idea presents an opportunity to gain in either scenario. The prima facie trade would be to take a currency position that benefits from a declining RMB in the short-term, as the SDR inclusion will not stop this trend right now. However, given that this is the market expectation and China is committed to a controlled depreciation, there may not be opportunities for significant returns. Long-dated out-of-the-money calls on USD/CNY may make sense if one believes in the scenario that PBOC will eventually initiate a significant one-time depreciation. A more creative approach is to focus on RMB’s volatility. This analysis concludes that liberalization may still be some years off and that liberalization will result in more market volatility if the Chinese government isn’t intervening in pricing. In a few years time, the yuan could be much stronger if liberalization wins over the confidence of foreign reserve managers and investors around the world. The yuan could also be much weaker if asset prices are allowed to reflect the economic weakness and credit troubles of China today and Chinese citizens are allowed to freely move their money offshore. Certainly, forex volatility will be higher if China neither restricts trading to a daily band nor intervenes in offshore markets. An option strategy to take advantage of this is a calendar strangle on the RMB. One could buy long-dated out-of-the-money calls and puts (a long strangle position) and short out-of-the money calls and puts (a short strangle position) that expire sooner to finance the long strangle. This position takes the view that volatility will be greater in the future and is agnostic to the long-term direction of the RMB. Such a structure benefits from a big move in the RMB in either direction in the more distant future. Taking on this position requires over-the-counter trading in which pricing is less transparent.